Vessel: I started fishing on my father's boat when I left school and can trace a family involvement with fishing back at least 4 generations. My wife Mairi and I have one daughter named Hannah. Unless my daughter takes over for the next generation, it looks like the fishing link seems set to come to an end. Only time will tell. 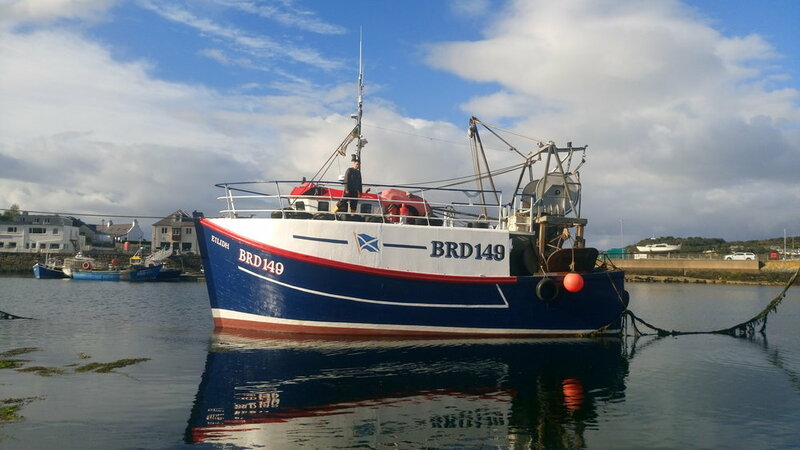 My fishing boat is called Eilidh which is a gaelic (traditional Scottish language) name for Helen. Built of wood in 2001, she is 12m long. Two other local lads work with me. We are based in Kyleakin on the Isle of Skye, and work the fishing grounds around Skye and beyond, travelling up to 50 miles from home sometimes. Weather permitting we tend to work from early on Monday morning till Friday morning and are away from home normally all week, Langoustines are our main catch, but we also catch some fish too.